Abstract : Annotations have been identiﬁed as an important aid in analysis record-keeping and recently data discovery. 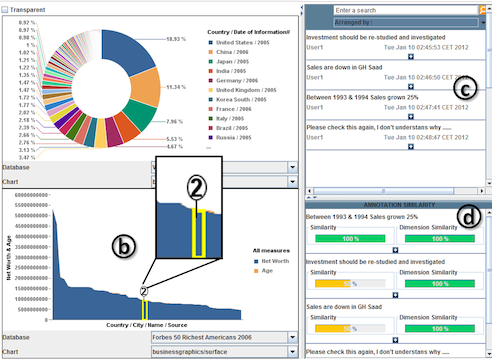 In this paper we discuss the use of annotations on visualization dashboards, with a special focus on business intelligence (BI) analysis. In-depth interviews with experts lead to new annotation needs for multi-chart visualization systems, on which we based the design of a dashboard prototype that supports data and context aware annotations. We focus particularly on novel annotation aspects, such as multi-target annotations, annotation transparency across charts and data dimension levels, as well as annotation properties such as lifetime and validity. Moreover, our prototype is built on a data layer shared among different data-sources and BI applications, allowing cross application annotations. We discuss challenges in supporting context aware annotations in dashboards and other visualizations, such as dealing with changing annotated data, and provide design solutions. Finally we report reactions and recommendations from a different set of expert users.